Remember the spirited little debate waged on this blog back in the weeks leading up to the release of Ke$ha's EP Cannibal over the deep dance track "Blow," of which one of my contributors and I had acquired different leaked versions with a 10-BPM difference in tempo? If not, here's the rub: my first exposure to "Blow" was tainted not simply because the cut I happened to acquire had been modified to 130 BPM rather than the 120 BPM version I would later learn was the actual album cut, but because it was so much better in its bastardized form. I wasn't thrilled when "Blow" was selected over "Cannibal" or "Crazy Beautiful Life," both of which I saw as potentially successful singles, not to mention my far-and-out favorite, "Sleazy," but what can you do? And now there's a video. The video features unicorns, Dawson's Creek alum James van der Beek (or "van der Douche," as he's called), and a rainbow-bullet gunfight, all held together by the gawking fascination of observing how genuinely foxy the cleaned-up trashy girl has made herself over. It's all part of the gradual phasing out of the Jack-loving neo-hippie sleeping in bathtubs/cars/empty motel pools character Ke$ha created - and executed masterfully - to supplement her debut on the pop/dance scene, no doubt. It's done so smoothly, though, that it passes all but unnoticed, just as Lady Gaga's transformation from icy and not terribly versatile disco queen to the avant-garde performance artist/monster she really wanted to be raised plenty of eyebrows, but not for the almost absurdly drastic character switch. Straying from an established persona that has attracted so many fans and followers, even when that might mean moving closer to reality, can be a risky move. Ke$ha deftly manages to adjust her character superficially, without abandoning the qualities that have made her so appealing to so many. In fact, they've never been more effectively displayed - it's the most likeable, fun, amusing and inviting she's been in any video. It's also not insignificant that in "Blow" her look - which hearkens back to the first video for "Take It Off" - is more accessible, not to mention appealing, than the grungy but largely benign "garbage-chic" of "TiK ToK" and "Your Love is My Drug," and certainly leagues away from the aggressively rebellious style of the "Take It Off" remake and "We R Who We R." Anyone with eyes would have seen that Ke$ha has always had some looks underneath the costumes and blue lipstick, but it's an intriguing surprise that by setting aside the attention-grabbing tools she's known for, she becomes even more fascinating to witness. Van der Beek's presence helps out quite a bit, of course; could Ke$ha have made a more brilliant choice of co-star (his pronunciation of "Ke-dollar sign...ha" is the clip's best moment, with its wry and winking self-awareness mixed with the actor's obvious amusement)? His appearance is an instant shoutout to older fans who grew up with the schmaltzy WB drama, while the younger crowd is able to appreciate his rugged handsomeness. 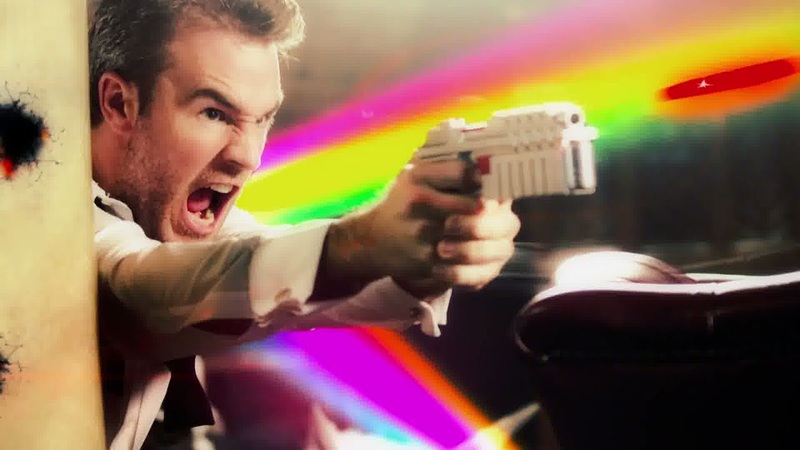 Even if they don't, there are plenty of unicorns and rainbows blasted pell-mell in a climactic battle between the muenster cheese-eating van der Beek and the glamorous State Official that turns the song's final chorus into an unexpected punch line. It was at that moment I finally gave in, gave up on my issues with the song and let Ke$ha's video win me over in spite of me the way her album did just over a year ago. 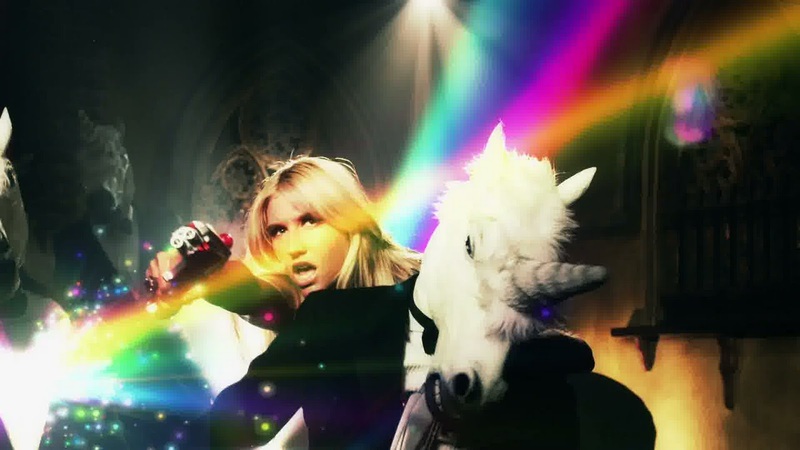 Music videos have never been Ke$ha's strength or apparent passion, although she has been a consistently good sport throughout each one she's done. "Blow" is her best by far, nailing the combination of music, visual and celebrity to which pop music ultimately strives - and it's a fun ride. The song, however, is still far too slow. First Listen: Ke$ha - "Blow"